Ni20 William Nicholas b about 1260 was granted the manor of Roundway by Baron Gilbert de la Roche about 1240 AD. The reason for the grant may have been sale but in those days manors had the purpose of giving an esquire the means to arm for battle and fight for the King or overlord. A baron usually had several manors, of which some would be granted to his vassals, and when a male line ended a daughter would become heiress but her husband would exercise the title de jure as it included the obligation to fight in battle. When the manor fell in abeyance for lack of a direct heir the Baron would grant it to a second or third son or an illegitimate son or to a page who had served valiantly under him. So it seems more likely that William Nicholas was either an illegitimate son of Gilbert de la Roche or his page or both, as a unusually stout and agile youth of the village near the Manor was likely to be the illegitimate son of Norman nobility. A comparison of Y-DNA test results of Nicholas/Nichols lines on the one hand and Roche/Roache/Rocke lines on the other has not been conclusive as many mutations can be expected along the various lines over 21 generations, but it does render enough evidence to make the theory appear more than just plausible. At present there is no known DNA data on this exact de la Roche line, but there there are many Roche and Rocke lines. David Nicholas, a known descendant has been so kind as to help with the test. His results are definitely closer to both those of other Nichols/Nicholas test persons and to several of the Roche/Rocke test persons than those or a presumed 5th cousin. And speak for both assignment to the haplogroup R1b1b2a1a and most likely Saxon and the plausibility of the de la Roche relationship. However, with about 6 of 37 of 21 generation from Gilbert de la Roche, as so many mutations over this time are possible, but the results of more distant Nicholas cousins are needed to show which generation mutated on which line, and more genealogical data in needed on the de la Roche family and their connection with these test persons. Roche genealogists of the Irish lines maintain the tradition that the first of the family in the British Isles were called in by the Welsh from the Brabant area before the Conquest to defend against Saxon incursions and were called over to Ireland by an Irish king two generations later to help in the endless Irish turmoils. Whether Gilbert de la Roche descended from this Roche family or others still on the continent who accompanied the Conqueror is an open question. Ni17 John Nicholas of Roundway b about 1380, d after 1461.
m2 Agnes Gore, daughter and coh. of John Gore of Hinton. m Isabella Pead dau of +1 Robert Pead at Ford of Bromham, Wiltshire. Sources: Wiltshire Visitation Pedigrees, 1623. Ni14-1-2-1-1 John Nicholas, heir of Roundway, born 25 July 1559 bur. at St. James of Southbroom 21 Nov 1604. Ni14-1-2-1-1-1 Ni14-1-2-1-1-1 Robert Nicholas heir of Roundway, bap. 21 Nov. 1593, will 2 Feb. 1668 continued below. -3-4 Edwin NICHOLAS (6.9.1840 Bishops Cannings-25.6.1880 at Rowde?) m 12.4.1862 at Bishops Cannings Sarah WOODROFFE 17.9.1837 Bourton # SHE IS 48721 557 OF "2. WOODROFFE FAMILY" ABOVE - see there for issue. Ni14-1-2-1-1-?-8-9 Richard NICHOLAS b c September 1779 in Coate, Wiltshire m Mary CLIFFORD b c January 1786 in Coate, Wiltshire -1 Robert NICHOLAS b c July 1803 in Coate, Wiltshire m Susannah NICHOLAS b c September 1795 in Bishops Cannings Wiltshire # She is 834 above. See there for issue. Ni14-1-2-1-2 Griffin Nicholas b c 1564 d 13 March 1635, Will 18 Oct. 1634. Ni14-1-2-1-4 Jane Nicholas b c 1567 m 9 June 1584 Richard Filke of Southbroom. Ni14-1-2-1-5 Petronella Nicholas b c 1569 m Humphrey Paradice of Southbroom. Ni14-1-2-1-6 Elianora Nicholas, m. Daniel Elson of Southbroom 1 Aug. 1597. Ni14-1-3 Margarie Nicholas, m. Willi Bound de Compton Chamberline in Wilts. m Mary Webb We13, daughter of +1 William Webb We14 of Bradford, Wilts. 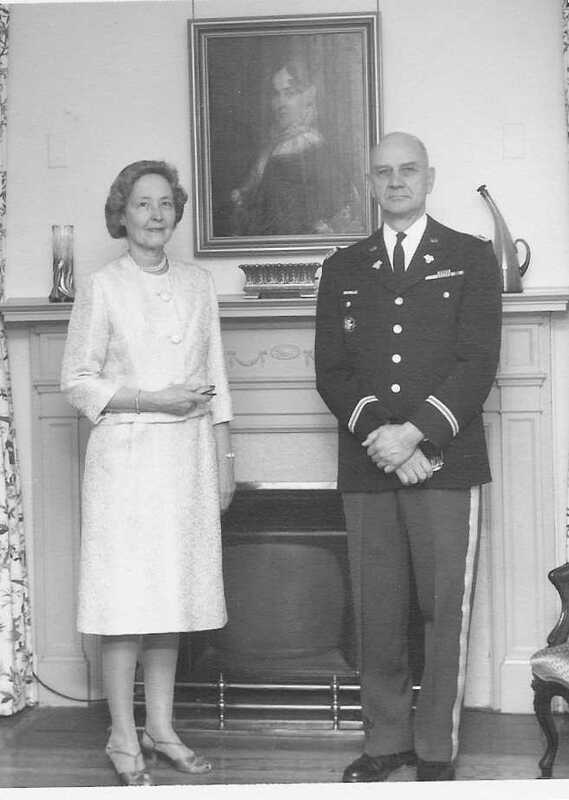 m Elizabeth Sheldon (Sh11), dau of +1 Philip Sheldon of Spatchle. 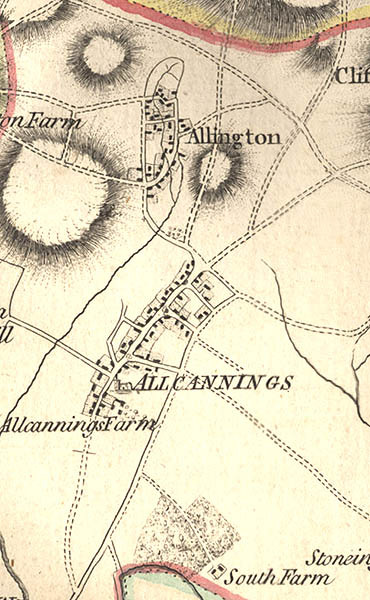 Calne is just a few miles north of Roundway and NW of Allcannings. 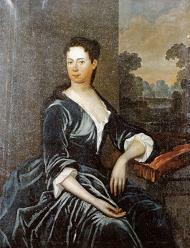 -2 KATHERINE CLOUDE, b 11 Oct 1607 Calne Wilts d England. -1-1-3 Sussanna Cloud, m in England and resided there. -1-1-2-3 William Cloud m Elizabeth Hayes. -1-1-2-6 Sarah Cloud, m John Baldwin, her widowed brother-in-law. -1-1-2-7 Elizabeth Cloud, m Joseph Hays. Ni13-2-1 Robert Nicholas, heir of Maningford, Wilts, proved 5 Oct. 1582.
m Jane St. John daughter of Nicholas St. John of Liddiard Tregose, Wilts. Died: will proved 5 Oct. 1582.
m May dau. of Thomas Lane . -1-1 Edward Nicholas of Maningford Bruce, admitted to the Inner Temple. Ni13-2-1-4 Catherine Nicholas, m Sir Thomas Broderick of Wandsworth, Surrey, knighted 1625. Ni13-3 Thomas Nicholas of Coate in Bishop's Cannings, will proved 1600, married Edith daughter of John Burden of All Cannings, and had son, Robert Nicholas, heir. m Susanna Hunton, daughter of William Hunton in Knoll (Knoyle), Wilts., who died 6 March 1658 (new calendar) aged 84 Died 9 Dec. 1644 Hunton Arms: Sable, a chevron ermine between three talbots passant argent. -1 Edward Nicholas, bapt. 3 Apr. 1593, Edward Nicholas was knighted 30 Nov. 1641. He was also Secretary of State under Charles I and Charles II. m. 24 Nov. 1622 in W.E. Jane Jay, dau of Henry Jay, Alderman of London. -3 John Nicholas b. 4 April 1597, aged 26 at visitation, killed in the Civil War. -4 Susanna Nicholas, bap 21 May 1599, died without issue, bur. 28 May 1622. -5 Maria Nicholas, b 13 Jan. 1601, m Edmond Reeves of Luckington, Somerset, 19 Aug. 1623 W.E. -7 Anna Nicholas, bap. 8 June 1603, m William Butterworth 30 Dec. 1630 in W.E. -8 Elizabeth Nicholas, bap. 12 April 1605. -9 Letticia Nicholas, m. Christopher Pachment 11 July 1643 in W.E. -10 Catherine Nicholas, bap. 6 July 1613. -1-1 John Nicholas, bapt. 23 Jan. 1623. -1-2 Edward Nicholas, bapt. 6 Mar. 1624. -1-3 Nicholas, bapt. 15 May 1627. -1-4 Matthew Nicholas, Bapt. 4 Feb. 1630. -1-8 ?x Nicholas, married L. Newburg. -2-1 George Nicholas, bapt. 31 July 1628, died before 1672. -2-2 Edward Nicholas, bapt 25 July 1629, Master of St. Nicholas Hospital at Sarum, living 1672, died before 1710. -2-3 John Nicholas, Oxon; M.A. 14 Jan. 1664, Warden of St. Mary's Coll. in Winchester; D.D 8 July 1675, died 27 Feb. 1711 aged 74, bur. Winchester Cathedral, Will dated 1707, proved 1712. -2-4 Elizabeth Nicholas, m. 1st Sir William Calley of Burdenrope, Wilts., 2nd Sir Thomas Mompesson of Salisbury, who died 1701, she died 29 Nov. 1709 aged 75, bur. at Winchester Cathedral. -2-3-1 Edward Nicholas, only child, of South Stoneham, Hants. Ni14-3 Margerie Nicholas, who married John Stokes of Sand, Wiltshire. Ni14-5 Christopher Rodolphus obijerent s.p., issue Gregory d. ? -1-1-1-1-1-1-1-5 Samuel Nichols, born 12 Mar 1748 in Billerica, md 7 Dec 1769 in Templeton to Jane Wiley [she is Jean in her birth record in Worcester]; 6 known children. (No death detail known.) But he had descendants in New York state … in Onieda and Jefferson Counties. -1-1-1-1-1-1-1-7 Paul Nichols, born 10 July 1753 in Billerica, md (1) July 1773 in Rutland, Worcester, MA [Rutland Vital records, printed, says INTENTION in Rutland] to Margaret Thomas [the intention is filed in Templeton, and says the wife was of Rutland], md (2) 10 May 1790 in Guilford, VT to Sarah Giles, died 19 Mar 1831 in Brainridge, New York; 6 known children of first marriage - last four born in Guilford, Windham,,Vermont; 1 known child of second marriage born in Vermont. -1-1-1-1-1-1-2-1-1-1 Henry Thomas Nicholls b 16 Jan 1845 Bedfont Middlesex d 22 Mar 1899 Randolph UT m 10 Dec 1872 ? -1-1-1-1-1-1-2-1-1-1-1 Henry Nicholls b 28 Jun 1873 Almy Wyoming d 2 Feb 1932 Salt Lake City UT m 14 Mar 1899 Randolph UT ? Ni15-2 William Nicholas, "slaine without the gatehouse in Runway" This was probably following the Battle of Tewkesbury in 1471, in which case William is likely to have fled the field upon the Lancastrian defeat and was pursued all the way back to Roundway. Ni15-3 Robert Nicholas b c 1450, who had three sons. Ni15-3-1-1-1-1 JOB NICHOLAS b 1667 in the village of St. Buryan, Cornwall, England. His parents were Thomas and Ann. Full details are not known about them but there is fragmentary evidence of a line of Thomases going back to about 1520 in the village. He married Aves Nicholas, a distant relative from the neighbouring parish of Sancreed. They had a son, Richard. -1 RICHARD Nicholas b 1697. A child of his second marriage was Richard. -1-1 RICHARD was born in 1738. He married Mary Nicholas, also a distant relative. They had a son, Richard. -1-1-1 RICHARD Nicholas b 1766 m Sarah Boase. They had a son, William. -1-1-1-1 WILLIAM Nicholas b 1809, a journeyman carpenter, was the last of my line to be born in St. Buryan. He had a son, William, in Paddington, W. London. -1-1-1-1-1 WILLIAM Nicholas b 1839. He had a son, my grandfather, Ernest. -1-1-1-1-1-1 ERNEST WILLIAM BOASE Nicholas b 1870 in E. London. Ernest retired as the Purchasing and Shipping Manager of Anglo-American Oil, an affiliate of the Standard Oil Trust, which became Esso UK. He had a son, my father, William. -1-1-1-1-1-1-1 WILLIAM Nicholas b 1902 in E. London. -1-1-1-1-1-1-1-1 y Nicholas b 1938 in Woodford Green, Essex, which was the Parliamentary Constituency of Winston Churchill. I am now retired in Cheltenham, Gloucestershire. m Alice x b 1436 Tannington she was about marrying age when Henry VI lost all possessions in France except Calais and many English soldners were arriving daily destitude on English soil after flight across the English Channel and the Crown was bankrupt and could not pay for the return of its troups to their homes. So the place of birth of George can be doubted but is likely to have been hers. This was in Michael de la Pole´s territory, the King´s greatest supporter, who may have arranged the marriage of one his men to the orphaned daughter of another who had fallen in France. Ni14-1-2-1-1-1 Robert Nicholas heir of Roundway, bap. 21 Nov. 1593 will 2 Feb. 1668. first Recorder of Devizes under Charles I and made ?Baron of the Exchequer in 1654 about the time of the demise of his distant cousin of the same name, who had acted in this position before him. m1 Margareta, daughter and coheir of George Worthley of Buckington, Wilts. on 13 april 1622, Will proved 2 Feb. 1668. Ni14-1-2-1-1-1-1 Anne Nicholas, m1 Thomas Hulbert of Corsham and had issue, m2 Sir R. Hurt and had issue. Ni14-1-2-1-1-1-3 John Nicholas, m. Julian, dau. of Sherman ?, bur. 29 June 1638 at St. Johns in Devizes. Ni14-1-2-1-1-10 Thomas Nicholas bap 1604 bur. 7 Sept. 1645. This followed Cromwell's routing of the King's army at Naseby by about 11 weeks..
m. Joan dau of John Chalonor of Lloran, Denbigs, bur. at Devizes 1732, Will dated 1668. Ni14-1-2-1-1-1-10-1-1 (Ni14-1-2-1-1-10-1-1) Robert Nicholas, bapt. 7 March 1662. Died 7 Jan. 1725, bur. St. James in Devizes. Ni14-1-2-1-1-1-10-1-1-1 Robert Nicholas, died 1690. Ni14-1-2-1-1-1-10-1-1-3 John Nicholas, born 1691, died 31 Aug. 1746, MP for Devizes. Ni14-1-2-1-1-1-10-1-1-4 John Child Nicholas, d. inf. Ni14-1-2-1-1-1-10-1-1-5 Edward Nicholas, b. 1695, m. Bridget, dau. of Cliffe (?Oliffe) Richmond of Ashton Keynes died 1731, had issue: Edward Richmond Nicholas. This is likely the great granddau of the John Richmond of Ashton Keynes b there in 1594 d in Taunton Maryland and Elizabeth Nicholas b about 1605 in Wilts Engl. as reported by ysearch.org/EBHRM and two other sources. This Elizabeth is probably of one of the Nicholas lines shown here. -10-1-1-5-1 Edward Richmond Nicholas Died: at Clifton, near Bristol the 27th December 1826 He was an eminent Physician of Devizes and elder brother of Rev. Dr. John Nicholas, died at Clifton, near Bristol the 27th December 1826; and was buried at Ashton Keynes, Wilts. his then eldest son Edward, his second surviving son Griffin, and his nephew Captain John Nicholas, R.N., son of Rev. Dr. John Nicholas, following him to the grave in the chancel of the Church of Ashton Keynes, for which purpose these three posted from Clifton to Ashton Keynes in Mr. Edward Nicholas’ private carriage, with relays of four horses, the hearse and their poor father having preceded them. Jenny Neate died Oct 12 AD. 1764, Aged 38. There is an elaborate monumnet to her in the church in Devizes. m1 Matilda Anne, youngest daughter of the late Lieutenant Colonel Christopher Chapman Bird, Secretary to Government at the Cape of Good Hope in Cape Town, Cape of Good Hope, on 17th August, 1841, and by her, who.died at Mauritius on the 11th March, 1856, and was a relative of the Willoughby's (Baron Middleton's Family). -10-1-1-5-1-2-1 Richmond Grffin Nicholas b 2 Jan 1843 at Dinapore, East Indies, appointed . from Gentleman Cadet at the Royal Military College of Sandhurst, a Cornet in the 3rd Dragoon Guards, 10 Feb 1874, Lieutenant 1st Kings Drag. Guards. -10-1-1-5-1-2-2) Elizabeth Matilda Mary Nicholas b 14 Mar 1844 d 6 Nov 1844 at Dinapore East Indies. -10-1-1-5-1-2-3 Mary Matilde Nicholas b at Simla, 24 Aug 1845. -10-1-1-5-1-2-4 Christopher Robert Griffin Nicholas b at Chatham Kent 22 Aprl847 d 24 Jan 1850 in Mauritius. -10-1-1-5-1-2-5 Cecilia Louisa Nicholas, b 22 Dec 1849 d 7 Feb 1850 in Mauritius. -10-1-1-5-1-2-6 John Chapman Griffin Nicholas, b 6 Jun 1854 in Mahebourg, Mauritius. -10-1-1-5-1-2-7 Matilda Adela Mary Nicholas b 4 Feb 1851 Mauritius d 15 May 1852.
all buried in the same grave as their mother, in Pamplemousses Cemetery, at the Mauritius. -10-1-1-5-1-2-8 Frances Charlotte Elizabeth Nicholas b 27 Jan 1858 at Folkestone, Kent, educated at the Royal School for Daughters of Officers of the Army. -10-1-1-5-1-2-9 Richard James Nicholas b at Lewes Sussex 13 Dec 1858, educated at Christ's Hospital (Blue-coat School). -10-1-1-5-1-2-10 William Scriven Griffin Nicholas, b 21 Oct 1860, di 20 May 1862, at Spring Grove Isleworth. -10-1-1-5-1-2-11 EmiIy Reeves Nicholas b 24 Feb 1862 d 3 Jun 1862 at Spring Grove Isleworth. -10-1-1-5-1-2-12 Gilbert de la Roche Nicholas b 3 Aug 1863 d 8 Jun 1864 Margate bur Heston. ..
-10-1-1-5-1-2-13 Clara Dionysia Nicholas b 16 Feb 1865 at Hounslow. Ni14-1-2-1-1-1-10-2 John Nicholas, bur. 1632. Ni14-1-2-1-1-1-10-5 John Nicholas, bapt. 1641 "omnium animarum socius", Will proved 1711. Ni14-1-2-1-1-1-10-7 Elizabeth Nicholas, bapt. 1639. The connection of the next three generations below is not included in the Visitations of 1623 or 1656 but found in a manuscript in the library in Lewis or Devizes and needs confirmation. From Ni8 down to Ni3 it was registered at the College of Arms by the author in 1975. Ni10 Robert Nicholas b Oct 1629, Bapt 14 Oct 1629? continued from above and his first wife, Elizabeth ? 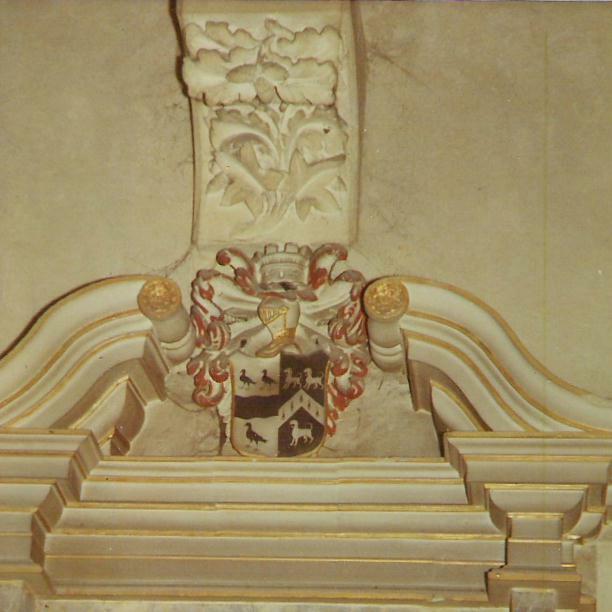 There continued to be a Nicholas as proprietor in Manston until 1800 presumably Robert's son Philip and later his son. A Jane Nicholas married Henry Roberts in Manston in 1757 but she was probably the daughter of Philip Ni8-1 or Robert Ni8-3 not the sister. Ni8 Dr. George Nicholas Born about 1695, matriculated at St. John's College in Cambridge in 1713, died –before Aug. 22, 1734 at Williamsburg, Virginia. +3 John Robinson b ca 1614 Cleasby, Yorks, England d 1 Mar 1688, Charles Parish, York Co, VA.
m Elizabeth Potter b ca. 1619, Cleasby d 2 Oct 1691, York Co, VA dau of Christopher Potter of Cleasby d 1642 & Isabell ?Smith b c 1600.
d 8 Sep 1780,in Hanover Co Virginia. m 29 Aug 1776 Gov Edmund Jennings Randolph, 10 Aug 1753 Tazewell Williamsburg Va d 12 Sep 1813 Clark Co Va John Randolph b 1776 d 1810 "The Tory"
-3 Edmund Randolph b 1821 d 8 Sep 1861 at San Francisco. Orator, called for assassination of Lincoln. a Lawyer In 1849 went to California Gold Rush m Tarmesia Meaux. x (II) RANDOLPH was born about 1783 in Of Lexington, Rockbridge, Va.
y RANDOLPH b about 1783. d 1786. Ni6-1-6 Edmonia Madison RANDOLPH b 17 Apr 1787. d Oct 1847. -2-9 George Junkin PRESTON b 2 Jul 1858 in Rockbridge Co VA d 17 Jun 1908 in Baltimore MD, at age 49. -1-1-4 Elizabeth Preston Cocke (1891–1981) of Richmond was active in numerous civic, benevolent and Religious activities:attended Sweet Briar College from 1909–12. She was trained as a nurse and in 1913 became president of the Girls' Auxiliary of the Instructive Visiting Nurses Association. The IVNA sponsored a summer camp for underprivileged children from Richmond. Although too frail to serve overseas, EPC joined the Army in 1917 as a reconstruction aide in Boston. m John Bennet Taylor -1 Charlotte Randolph Taylor m Moncure Robinson b 2 Feb 1802 d 1865 son of John Robinson b 1773 York Va d 1850 and Agnes Conway Moncure grson of Anthony Robinson and Mary Phillips. -2 John Charles Randolph Taylor b 30 May 1812. m 22 Dec 1834 Albemarle Co m Martha (Patsy) Jefferson Randolph, dau of Col. Thomas Jefferson Randolph andJane Hollins Nicholas Ni6-3-6 see below. -1-1 Frances Brown "Fanny" Robinson b 11 Oct 1858 d after 1903 m Algernon Sydney Biddle son of George Washington Biddle and Maria McMurtie grson of ClmentMary Searle Barclay grgrson of Clement Biddle and Rebecca Cornell 2grgrson of John Biddle and Sarah Owen. -2-2 Jane Randolph Taylor b 1838. d unm in 1917 and bur Monticello. -2-4 Rev. Jefferson Randolph Taylor b 1842 d 1919 and bur MonticelloPrivate, C.S.A. Southall Artillery, Jackson's Corps. m Mary Hubard Bruce. -2-5 Margaret Randolph Taylor b circa 1844. m William Lewis Randolph, son of William Mann Randolph and Margaret Smith Randolph. -2-6 Charlotte Taylor b circa 1846. d circa 1846. -2-7. Stephen Mason Taylor b 1847 d in 1917 and bur Monticello.1864 C.S.A. Rockbridge Artillery. m Mary Mann Page. -2-8 Cornelia Jefferson Taylor b 1849 d 1937 unm bur Monticello. -2-9 Moncure Robinson Taylor was born in 1851. m Lucy Willis. d 1915 and bur Monticello. -2-10 Edmund Randolph Taylor b 1853 m Julia Pendleton. -2-11 Sidney Wayles Taylor b 1854 d in 1856 bur Monticello. -1-1-4 Sydney Geoffrey Biddle m Olive Caldwell b 1893 Sallie E.7 Marshall b 25 Jul 1853. -1-1-5 Claudia Marshall was born in 1855. m J.B. Morson on 19 Aug 1873. -1-1-6 Burwell Marshall b 1857. m Lizzie Veech in 1883. -1-1-7 Ewing Marshall b 1858. -1-1-8 Marie M. Marshall b 1860 m Phil R. Allin. -2-1-1 Patsy Jefferson Taylor b 24 Mar 1867. -2-1-2. Raleigh Colston Taylor b 22 Jun 1869. -2-1-3 Lewis Randolph Taylor b 22 Sep 1871. m Natalie Sefton. -2-1-4 John C.R. Taylor b 21 Aug 1874. m Mary Leigh. Ni6-1-8 Lucy Nelson RANDOLPH was born about 1789 d 1847.
m Judge Peter Vivian Daniel. m Elizabeth ?Galbraith b c 1705 the otherwise inexplicable appearance of this as a middle name of a great granddaughter suggests that it was a maiden name of one of these two unknown great grandmothers. Robert Buchanan and Jane x s.a.
Ni5-1 Col. Robert Carter Nicholas b 1779/?93 (there is likely a confusion with a cousin of the same name who moved to New Orleans) - 1836 (?57), He was known as a brilliant talker. Portrait of Margarette Galbraith Nicholas 1789 - 1819 owned by Gen. Charles Parsons Nicholas in 1975, now by his grandson, Prof. Edward Lee Ni5-8 Margarette Galbraith Nicholas (1789 – Aug.13, 1819) married first Gen. J.C. Bartlett, second Gov. Thomas Fletcher, died without issue. She was portraited by Jewet; the portrait in the posession of Brig. Gen. Charles Parsons Nicholas Ni3-5-4 in 1975 passed to his daughter, Frances, who has written a charming biography of this mathematical genius. Born 1 Aug 1831 Louisville, Kentucky. Died 1896, March 15, in Shelby County, Kentucky. Buried in Grove Bill Cemetery, Shelby County, Kentucky. Ni3-7 Patrick Pope Nicholas, 2/11 b 17 Dec. 1869- June 1941 m 30 Sep 1897 Mary Willis Middleton. -3 Laura Elizabeth Goodson m y? Ni3-8-2 Katharine Prather Nicholas unmarried Ni3-8-1-1 Thomas Prather Nicholas II m Anne R.
m2 Mary Smith (Ni6-3-8-1), granddaughter of his uncle, Wilson Cary Nicholas (Ni6-3), and his aunt, Margaret Smith (Sm6-4). Ni4-11 Sarah Nicholas b 1852 d after 1880 apparently living in the household of Robert Hill Carter Ct8-2-4-5-3 in the Scottsville Albemarle Co Va census 1880 together with his unmarried daughters and son, who she may have later married. m2 8 Jan 1833 Esther Goodwin Stevenson. -1 Wilson Cary Nicholas b: SEP 1836 in New York d AFT 1900 in Baltimore Co, Md Captain Maryland Line Confederate States Army, was distinguished for his dash and gallantry during our Civil War, in which he served during its early years as a captain in the First Maryland Infantry, under Stuart and Bradley Johnson, participating in first Manassas, Jackson's Valley campaign, and in all the engagements in which that noted regiment took part up to the time it was mustered out in the fall of 1862. Later on Captain Nicholas won fresh distinction as an officer of the Maryland Cavalry, where he served up to the time of the surrender. Among those now living of that gallant band of Marylanders, "who left their homes and those they cherished" to fight for "Dixie," no one is better known or more beloved than Capt. "Willie Nicholas." lived at 'Atamasca' - inherited from his aunt, widow of John Patterson, a brother of Mme. Bonaparte. Ni6-3-7 Sidney Nicholas - married Dabney Carr. Ni6-4 John Nicholas b 1756 d 31 Dec. 1819 ),d 1801; On Sunday 21 Oct 1803, was member of Congress 1793 they together with the Rose Family removed to Geneva, New York, where John had numerous descendants. Ni6-4-1 Gavin Lawson Nicholas wrote and article for the Geneva Daily Times in 1873 over his recollections of moving to Geneava as a young lad. Ni6-4-2 Anne Cary Nicholas married Abraham Dox. Ni6-4-3 Susan Rose Nicholas, married Rev. Orin Clarke, issue: Susan L. Clarke married, George N. Dox. Ni6-4-9 Margaret Caroline Nicholas married Dr. F. B. Leonard of Lansingburg, N.Y.
Ni6-4-11 John Nicholas b about 1795 in Va settled in Ontario county in 1803 with Parents, at what is now known as White Springs. He was a lawyer by profession, and was the first judge elected in Ontario county. His son, Robert C., was but a year old when his father moved here. He engaged in farming, representing his county several times in the Legislature. He was one year State Senator, and was a member of the Constitutional Convention in 1846. He married Mary Selden Rose, dau of Robert S. Rose, about 1826, and they had four children: John C., George W., Robert R., and Jane. John C. is dead; Jane married Z. S. Claggett, and lives at Hagerstown, Md. 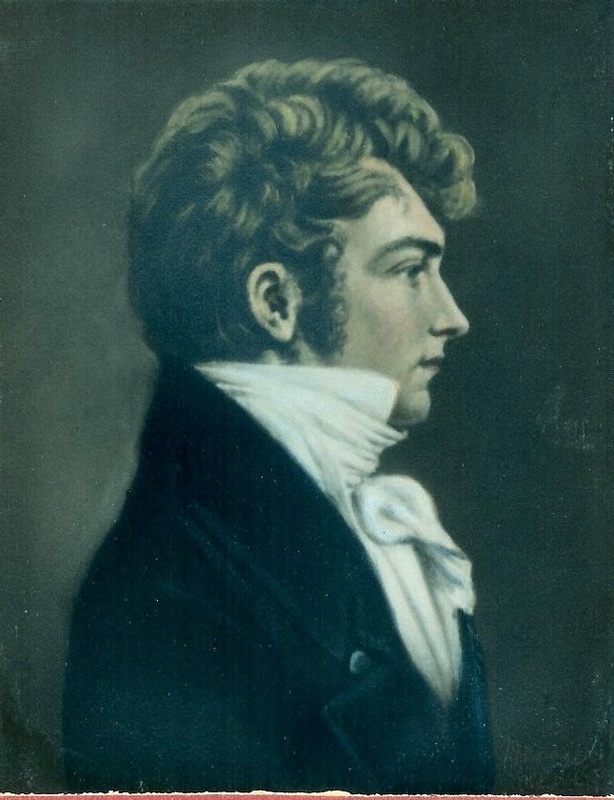 Robert C. died in 1854 and his wife in 1837. Hon. George W. Nicholas was born October 12, 1830. He graduated from Hobart College in 1850, read law with Judge David Buel in Troy, and attended law school at Ballston Spa. He was admitted to the bar in January, 1852. He practiced in Chicago two years, then returned to Geneva, where he has since resided. In 1855 he engaged in the farming and nursery business, and was supervisor of Geneva during the war and for five years. In 1870 he was elected member of the Legislature, and has been justice of the peace since 1881.
m 1854 Olivia M. Gallagher, daughter of George Gallagher, of New York. 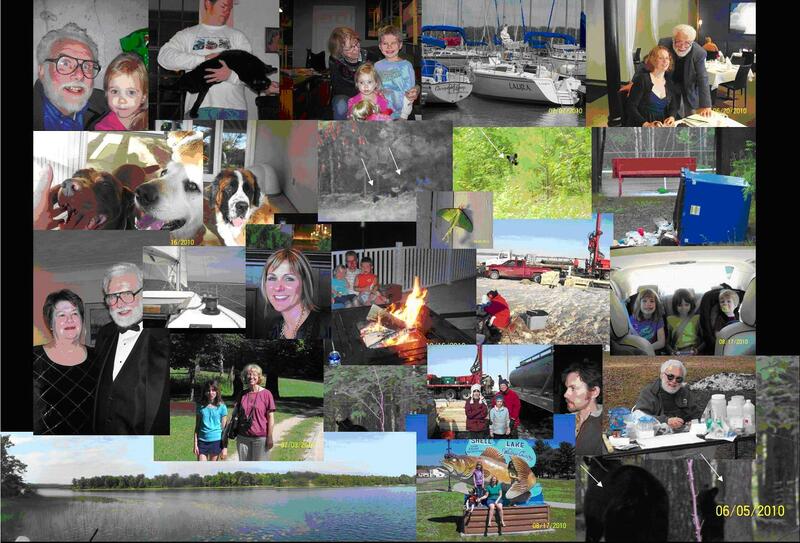 Ni6-4-1-2-1-1-?-1 Philip Norborne Nicholas, one of Geneva NY's best known lawyers and a citizen of distinction, was a descendant of John Nicholas who early in the last century came to Geneva from the South to occupy the White Springs Farm, being his grandson. P. N. Nicholas was born in 1845 and died in 1919 and had a most distinguished career as a lawyer, farmer and nurseryman. Being a graduate of Hobart College in the class of 1866, he was always most earnestly interested in the growth and welfare of that institution and was from 1872 to 1874 secretary of the Associate Alumni of the College. In 1884 he was elected a trustee of the College, remaining in that capacity 35 years until his death. 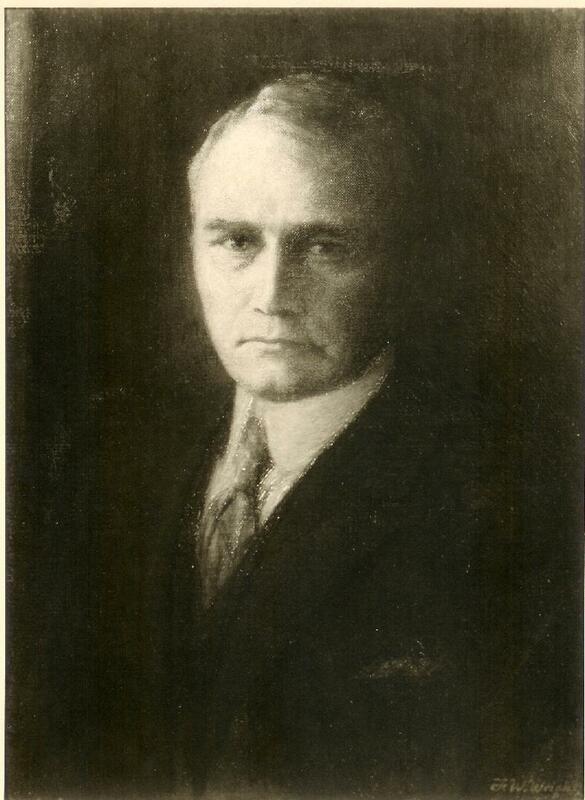 He was secretary of the Board for a period of 34 years and in 1917 was chosen college treasurer and bursar, having served as assistant in that capacity for several years previously. 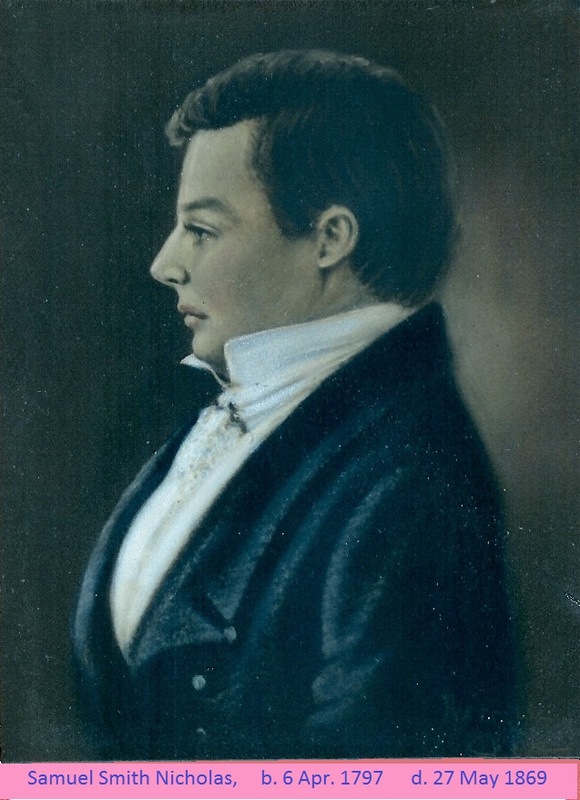 In addition to his legal work with the firm of Hawley, Nicholas and Hoskins, Mr. Nicholas took a most active interest in civic and community affairs in general. He served as a member of the Board of Education, was a member of the Humane Society and served as president of the local branch, and for the first eight years of its existence member of the Board of Control of the New York State Experiment Station. His church affiliations were with Trinity Episcopal church and here he served as a vestryman for 25 years. For 35 years until his death he was a member of the Geneva Cemetery Commission; was police commissioner for two terms and was most active in organizing the Geneva police department. In 1887 he was elected Supervisor and was re-elected for four successive terms. Mr. Nicholas was one of Geneva's early advocates of an adequate park system for the city, and his efforts were in 1916 directed toward urging that the city acquire the abandoned canal lands and the strip south of them for public park purposes, a thing which has only lately been brought about, however. When the World War broke out Mr. Nicholas was appointed by President Wilson to membership on the Appeal Board of the Second District, meeting in Rochester and representing seven counties. No decisions of this board were reversed by the President, to whom all determinations were forwarded. Of him it was said that he "for many years served efficiently and gratuitously in many positions in public life" and the he "was constantly helpful to the poor and those in trouble." Mr. Nicholas died in 1919, but Mrs. Nicholas was still living on Washington street, Geneva NY. Mr. Nicholas was a member of the Bar Association, of the University Club, Kanadesaga and Country Clubs and of the Sigma Phi Society. m 1869 Emily E. Jackson, whose father had formerly been a president of Hobart College and who then was serving as president of Trinity College, Hartford, Conn. This may be the same Tucker family into which Rose Gerard married as there is the necessary temporal, geographic and social proximity to expect it. -4 George Hatley Carter married Emma Steinrod. -5 Edmonia Carter married Benjamin Tasker Chinn, son of Dr. John Yates Chinn and Sarah Fairfax Carter. -6 Ann Cary Carter married Robert Mottram Lewis, son of John Lewis and Frances Tasker Ball. -2-2 John Lewis Brooke b 24 OCT 1824 Gloucester Co m Maria Louisa Ashby -1-1-1 Rebecca Peyton Marshall b about 1830 m Jaquelin Ambler Marshall. -1-1-1-1 Jaquelin Ambler Marshall III b about 1850 m Eliza Randolph Turner. -1-1-1-1-1 Charles Turner Marshall b about 1875 m Julia McIlvaine Spencer. -1-1-1-1-1-1 Julian McIlvaine Marshall b about 1900 m Henrietta Armitt Harrison. Ni6-5-2 Anne Cary Norton m Gen William Armistead son of John Armistead m 17Mar 1764 Lucy Baylor b New Market Caroline Co grandson of William Armistead and Mary Bowles -1 Herbert Armistead. Ni6-5-3 Rev. George Hatley Norton b 1787 at Winchester VA resided in western New York. Ni6-7 Lewis Nicholas (1766 - '/ ), who lived in Albemarle. Ni6-8-1 Robert Carter Nicholas b. 22 Apr 1802 d. 24 Apr 1868 d. 24 Apr 1868; merchant & miller of Buckingham Co; bur. Richmond. Ni6-8-1-1 Robert Carter Nicholas; b. 21 Nov 1838; d. 7 July 1881; merchant in Buckingham Co; bur. Richmond. Ni6-8-1-2 Martha M. Nicholas; b. 1 Nov 1841; d. 17 Feb 1889; bur. Richmond. Ni6-8-1-3 Hamden Bigelow Nicholas; b. 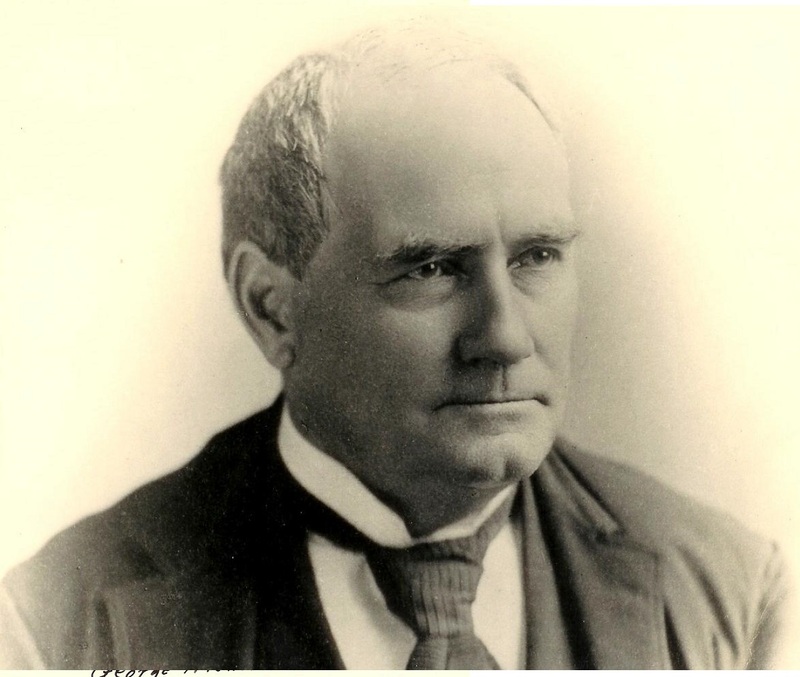 11 Jan 1844, Buckingham Co d. 9 June 1909; lawyer & civil engineer in Buckingham Co; bur. Richmond. Ni6-8-1-3-1 Alice R. Nicholas; b. ca. 1870. Ni6-8-1-3-2 Jane Pleasants Nicholas b. June 1872; fl. 1930, Hinds Co, MS; issue: Willie Sue Stockett (b. ca. 1898), Lucy Holt Stockett (b. ca. 1900), Samuel Henry Stockett (b. ca. 1902), Hampden Nicholas Stockett (b. 17 Oct 1903 d. 13 Dec 1989), Alice Stockett (b. ca. 1905), Richard Carrington Stockett (b. 4 Sept 1906; d. 29 July 1988), Robert Carter Stockett. m Samuel Henry Stockett; b. ca. 1862, MS; fl. 1930, Hinds Co; cigar salesman. Ni6-8-1-3-3 Robert Carter Nicholas b. 19 July 1873 fl. 1920. Augusta Co; miller & traveling motor salesman. m Ada Katherine McCutchan; b. 26 July 1877; d. 31 Mar 1933, Staunton; dau of James L. McCutchan QV & Rachel Buchanan. Ni6-8-1-3-3-1 Katherine B. Nicholas b 24 Aug 1905 d. 29 Mar 1959, Richmond. Ni6-8-1-3-3-2 Robert Carter Nicholas b 7 Aug 1911 d Nov 1986, Staunton. Ni6-8-1-3-3-3 Hamden Bigelow Nicholas b 24 May 1913 d 14 June 1968, Lynchburg. Ni6-8-1-3 Mattie Carrington Nicholas; b. 9 July 1877, Virginia fl. 1930, Alleghany Co, VA.
m 14 Oct 1896 Dr. Boliver Buchanan McCutchan b. ca. 1864, Augusta Co; fl. 1930. Ni6-8-1-1 Robert Carter Nicholas b 22 Apr 1802 d 24 Apr 1868. See below. Ni6-8-1-2 John Scott Nicholas b ca. 1805 d 5 Nov 1875. See below. Ni6-8-1-3 George W. Nicholas b ca. 1808 See below. Ni6-8-1-4 Judith Nicholas m. _ Moseley. Ni6-8-2-2 Anne Trent Nicholas b ca 1838. Thomas Deane Jellis he m2 Katherine Ambler. m 29 June 1892 in Marion NC Anna Rockwell Neal b 4 Dec 1868 Marion NC d 14 Nov 1935 dau of John Neal. Ni6-8-1-2-1-8 Gordon Barbour Ambler b. 14 May 1896, Forsyth Co, NC d Dec 1951 bur Richmond. Ni6-8-1-2-1-8-1 Gordon Barbour Ambler, b. 27 Aug 1926; d. 26 Oct 1974, New York; bur. Richmond. Ni6-8-2-2-1-3 Luna Ernestine Ambler; b. 1 Mar 1902; d. 24 Oct 1974; bur. Richmond. Ni6-8-2-5 William Trent Nicholas; b. ca. 1848; fl. 1950. Ni6-8-2-6 Robert Carter Nicholas; b. Feb 1853, Buckingham Co b. Feb 1853, Buckingham Co; fl. 1900, farmer & farm agent in Buckingham Co.
-1 Annie T. Nicholas; b. Aug 1877 fl. 1900. -2 Mary C. Nicholas; b. July 1880 fl. 1900. Ni6-8-3 George W. Nicholas; b. ca. 1808; fl. 1860, farmer in Buckingham Co.
m Caroline; b. ca. 1820, VT.
Ni6-8-3-1 Henry B. Nicholas; b ca. 1841; fl. 1860. Ni6-8-3-2 George Nicholas; b ca. 1843; fl. 1860. Ni6-8-3-4 Charles Nicholas; b ca. 1848; fl. 1850. Ni6-8-3-5 Laura Nicholas; b ca. 1849; fl. 1860. Ni6-9-1-4 Catherine Norborne/?Norton Nicholas b 27 NOV 1830 in Richmond Va d 27 DEC 1894 in Baltimore Md Interested in charitable institutions of Baltimore and was President of the Young Women's Southern Relief Association. -3 William Henry Brune b JUL 1857 d after 1906 educated in private schools in Baltimore, at St. Paul's School, Concord, N. H., and Harvard College; A.B., Harvard, 1878; LL.B., University of Maryland, 1880; Judge Appeal Tax Court of Baltimore City, 1903-1906. Ni6-9-5 Philip Cary Nicholas b 1830 d aft 1880 in Richmond, well known member of the bar in Richmond, Va, and a long efficient librarian of the State Library of Virginia. Ni6-9-6 Elizabeth Byrd Nicholas b 16 Dec 1830/?2 d 30 Jul 1901 lived with mother and bro Philip. Ni6-9-7 Sidney S Nicholas b 1833 m Selma Hudgins. Ni6-10 Mary Nicholas b 1759 d 1796 unmarried. or possibly the same who married Patrick Rose b 4 JUL 1745 in Stafford Co Va ( The dates in Rose pedigree for these children are not plausible or given and need reconciliation.) -1 Patrick Rose, Jr.
-3 Elizabeth Rose m Wilson N. Price, Dr.
Ni7-2 John Nicholas of Seven Islands b about 1727 d 1795 He was clerk of Albemarle 1749-1815, Burgess 1756 -58, and of the Convention of 1774-75, of Buckingham Co. (great-grandtfather of Mrs. Willie Harrison Nicholas, who married Philip Barbour Ambler). He married Elizabeth Fry, dau of Colonel Joshua Fry of Williamsburg. -1-2 Virginia Nicholas Lightfoot m y Scruggs. m2 Elizabeth Banks b 1744 Culpeper Co Va d 12 Oct 1801 Lincoln Co Ky -1 ELVINA NICHOLAS. -2 ANNE NICHOLAS b 1797 Washington Co Tenn d Pulaski co KY m 1822 in Pulaski co ky JEREMIAH PIERCE b 1798 in Wilkes Co, NC and died in Pulaski Co KY son of FRANCIS PIERCE and ELIZABETH. -2-3 WASHINGTON PIERCE b 1827. -3-1 USLEY GREGORY b 1825 Wayne Co Ky d Abt. 1924 m 24 1856 in Wayne Co JOHN VAUGHN Apr b 1828 d Abt. 1910 son of JAMES VAUGHN and ELIZABETH TROXELL. -4-2 ELIZABETH NICHOLAS b May 15, 1836, Wayne Co, Ky m. SAMUEL WESTLEY TURPIN, Wayne Co, Ky; b. Wayne Co, Ky.
-4-4 JOHN NICHOLAS b 1847. -4-6 ALBINA JANE NICHOLAS b 1851. -4-7 MARY E NICHOLAS b April 03, 1853. -4-8 DISA ANN NICHOLAS b 1859. -3-1-2 LEWIS VAUGHN b 1857. -3-1-3 THOMAS VAUGHN b 1858. -3-1-4 JAMES VAUGHN b 1860. -4-5-1 JAMES L NICHOLAS, b. 1868, mill springs, Wayne Co. KY.
-4-5-2 WILLIAM ALBERT NICHOLAS, b. 1871, mill springs, Wayne Co. KY; d. 1939, Le Roy, Mclean ILL.
-4-5-4 MARY JUNE NICHOLAS b 1883 wayne Co Ky.
-3-1-1-6 CHARLES VAUGHN b 1875 d 1974 m ROSE CLARK b 1877. -4-3-3-1 WILLIAM FRANKLIN NICHOLAS, b 22 Jun 1898 Mt. Moriah, Mo d Los Angles Calf. -4-5-5-1 ROBERT WESTLEY NICHOLAS b 10 Nov 1908 BETSY, WAYNE CO KY d Nov 18 1979, TULSA, TULSA CO OK m MARTHA ELIZABETH SIERER, January 14, 1932, San Antonio, Bexar Texas; b. August 26, 1909, Hudson, Lenawee co, Michigan; d. December 17, 1997, Drumright, Creek co, Oklahoma. -4 Judith Nicholas m _ Moseley. 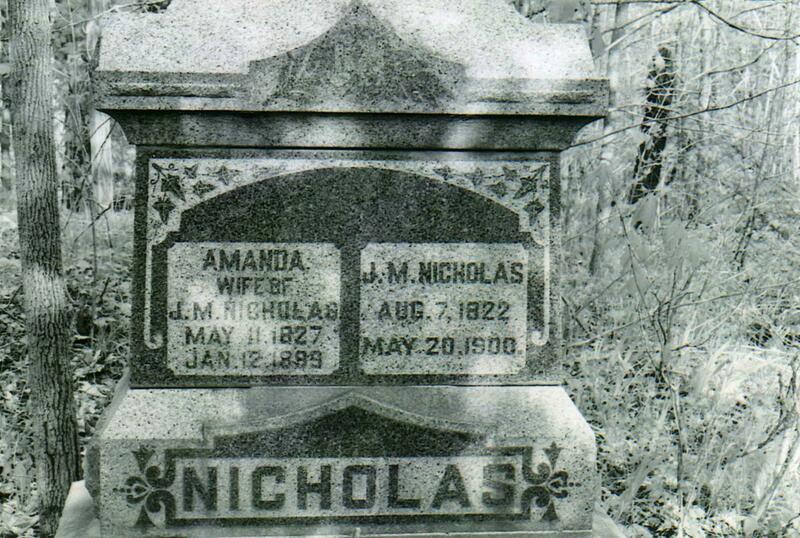 -2-4-1 John Ambler Nicholas of 'Amherst VA b 17 Sep 1866. m Elsie Norvell Warwick b 28 June 1874 d 8 May 1903. -2-6-1 Annie Trent Nicholas b Aug 1877 Seven Islands d aft 1900. -1-3-3-1 Katherine B. Nicholas b 24 Aug 1905 d 29 Mar 1959 Richmond. Ni6-4), John Rose (Ni7-2-5-2) and others. Ni7-2-6-2 Martha Scott married Dr. Royster. ?Ni7-3-1 Col John Nicholas, b c 1755 d 1818, long Clerk of Dinwiddie, possibly the Participant in the Battle of Camden SC 16 Aug 1780 ("Gates' Defeat"). m 15 Oct 1845 Amanda V.(Catherine) Hester b 11 May 1827 in Fleming Co Ky d 13 Jan. 1899 in Putnam Co In +1 Adam Hester b Mar. 1, 1799 d. Aug. 2, 1882. Buried: near John Hester's (He6) grave in Lafollete's Burying Ground about 2 miles West of Parkersburg, Ind. Adam Hester migrated from Fleming Co. Ky. to Putnam Co., Ind., with his wife and 6 eldest children in 1834 and was one of the earliest settlers there, when there were still Constalk Indians living along the Conrstalk Creek. In those days a light was made by digging out a turnip filling it with oil or grease putting a stic in the center and lighting it; it would burn all night. He hauled lime by oxen team to Crawfordsville, Montgomery Co. for building their second court house. 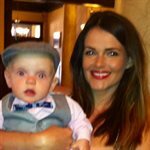 Ni11-2-1 Isabel NICHOLLS 1 was born 1509 in Brundish, Suffolk, England. Ni11-2-2 Anne NICHOLLS 1 was born 1511 in Brundish, Suffolk, England. Ni11-2-3 Katherine NICHOLLS 1 was born 1513 in Brundish, Suffolk, England. -4-5-1 John STRATTON bap 8 Nov 1604 d 1644. -4-5-7 Elizabeth STRATTON b 1617 and died before 29 Jul 1668 m Salem MA John Thorndike b 1600 Great Waddington Suffolk d Nov Westminster London. -4-5-8 Dorothy STRATTON b 1619 in Badingham d after 19 Jul 1641. -4-5-7-5 Mary THORNDIKE b 1649 in Ipswich, Essex, Ma d 5 after 30 Mar 1674. -4-5-7-6 Alice THORNDIKE was born 1652 d after 14 Dec 1690. -4-5-7-3-1 Elizabeth PROCTOR b 1663 in Salem, d 5 after 29 Nov 1678. -4-5-7-3-3 Martha PROCTOR b 4 Jun 1666. -4-5-7-4-1 Mary THORNDIKE b 8 Jan 1669 d Oct 1732. -4-5-7-4-2 Elizabeth THORNDIKE b 14 Oct 1670 d after 7 Sep 1729. -4-5-7-4-3 Hannah THORNDIKE b 14 May 1673. -4-5-7-4-4 Captain John THORNDIKE b 22 Jan 1675 d 24 Mar 1760. 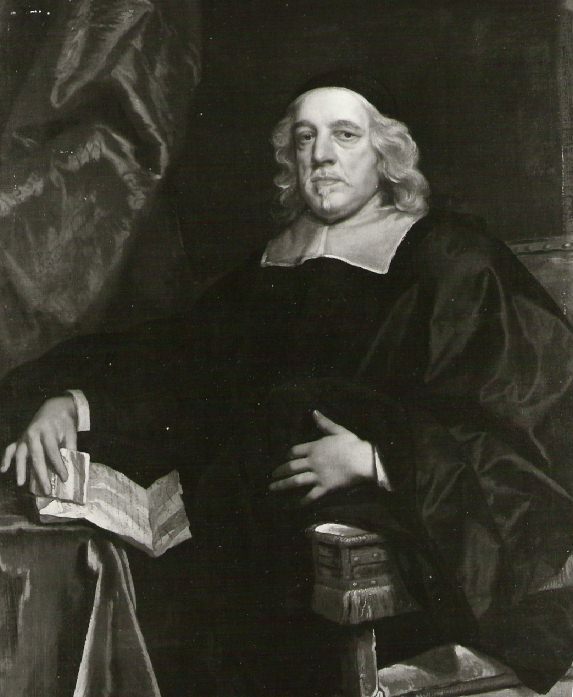 -4-5-7-4-5 Paul THORNDIKE wb 17 Apr 1677 d 14 Feb 1742. -4-5-7-4-6 Martha THORNDIKE b 1681 d 5 Dec 1764. Ni11-2-5 Lewis NICHOLLS 1 was born 1519 in Brundish, Suffolk, England. This family begins with the princes imposed on Denmark by the Swedes whose Yngling descent has yet to be detailed. The name obviously means "the blond". Three brothers fought with the Conqueror at Hastings, one had overseen the building of the ships that carried his men and horses over the channel and commanded the fleet during this operation. Hence their rewards were great when the spoils were divided. The American progenitor of this family probably immigrated to Accomac Virginia sometime after Feb 1623 and perished in the great hurricane of 6 Sept. 1667 there. Under the assumption that his son Benjamin was born about 1640 in Accomac Co., Virginia, his birth year has to be set before 1625 with a probability of about 1615. St16 =17 Catherine Stanley married Sir John Savage of Clifton (b c1422, d 22.11.1495), knighted as a Yorkist after the Battle of Tewkesbury but the commander of the left wing of Henry Tudor's army at Bosworth Field. m Aaron Fontaine son of Peter Fontaine and Elizabeth Wade. We20 Thomas West married Alianore de Cantelupe Ca20 daughter of John de Cantilupe Ca21 s.a. and Margaret de Mohun Mo21 s.a.
return to index send author and e-mail: william@multiwords.de misuse for spam is strictly forbidden!